It is important to remember that within the accrual financial system of onCourse, that every action has an opposite. When an enrolment is created, an invoice is generated to the payer. When the payer pays the invoice, a payment in record is created. If you want to cancel an invoice or refund a payment, you need to generate an equal and opposite record. To reverse an invoice, you create a credit note (a negative invoice) and to give someone back their money, you need to create a payment out. This section outlines the common processes involved in creating credit notes and refunds. If you need to remove a student from a class, due to them withdrawing or failing to attend, you need to cancel their enrolment. If you wish to provide them with a credit note you can do this at the time of the enrolment cancellation. The first step is to cancel and credit the existing enrolment. Click on the cogwheel option in the top right hand corner and choose "Cancel 1 enrolment". This will bring up a dialog with a checkbox offering to also credit the enrolment fee charged. If you keep this ticked, you will create a create note as part of this process. If you uncheck it, you will retain all the student's fees as part of your business income. 99% of the time you want to create a credit note. If the student's enrolment is unpaid, the credit note will pay their unpaid invoice, rather than leaving it as an unpaid debt on your books. In the cancellation window, choose if you want to send the student a credit note email. If you are have not previously agreed to transfer the student to another class, or provide them with a refund, selecting this option will let the student know how much credit they have available with you for future redemption. This process will cancel the enrolment, and create a credit note in the system for the value of the existing enrolment. Note that the credit note will apply to the original payer of the invoice. This may not be the student who enrolled in the class, but their employer, parent or other third party. Read the text in the cancellation window to confirm if the student and the payer are the same or different people. If the invoice originally issued for this enrolment remains unpaid, the credit note created will create an automatic contra payment against that invoice, in effect 'cancelling' it from requiring payment. If the originating invoice was paid in full, the credit note can be used to contra pay another outstanding invoice from that debtor, if you choose. 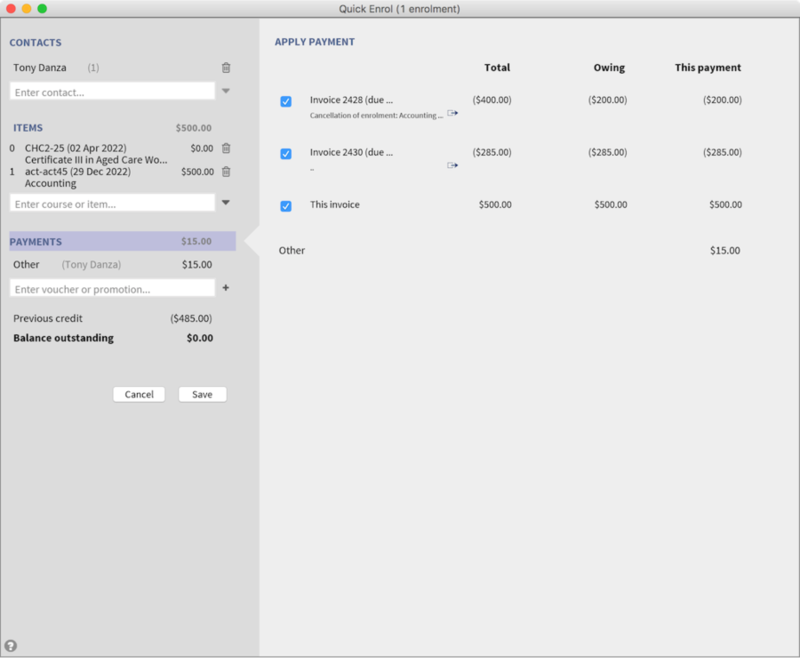 You can manually select this option from the invoice list window in the cog wheel options. Please note that a payment back to the student will not be automatically created after cancelling an enrolment. That student might want use the credit to enrol into another class. Or you may wish to contact the student and arrange a refund. The next sections explain these options in detail. While all enrolments in onCourse create outcomes, including those in non-VET programs, the outcomes that can cause concern for reporting are those associated with VET enrolments. During the enrolment cancellation a checkbox is ticked by default that says 'Delete outcomes linked to this enrolment with status "not set"'. If you have not given any outcomes a status yet, this will mean all the outcomes attached to the enrolment will be deleted. This will be desirable for most types of enrolments, where you do not want to report the student as having enrolled in this program at all for AVETMISS purposes. If the student needs to be reported as a withdrawn student for AVETMISS purposes, you have two options. Either set the value of the outcomes before the cancellation process, and they will be retained by default. Alternatively, you can untick the option 'Delete outcomes linked to this enrolment with status "not set"' so all outcomes, both set and not set, will be retained. To avoid AVETMISS errors, you will need to make sure that any unset outcomes that are retained are given a valid outcomes status, such as 60 - Withdrawn after processing the cancellation. Retained outcomes attached to cancelled enrolments are reported like all other outcomes. If you want to suppress them from all reporting, set the enrolment to 'Do not report for AVETMISS' on the enrolment general tab. You can also elect to charge a cancellation fee (with or without tax) as per your college policies. The difference between the fee paid, and the cancellation fee charged will be available as credit to the student, or can be refunded to them. Note that if you charge GST, this amount will be added on to the value you specify e.g. in the screen shot below a $20 plus GST fee has been charged, totalling $22. You can select to have this administrative fee deposited into the income account of your choice. By default, the income account associated with the enrolment income line will be selected. Any GST component will be credited to the GST account. On occasion, you may have cause to cancel and enrolment that was originally paid for by an onCourse voucher. If this is the case, a warning will appear in the cancellation window to advise you that a credit note will be made for this student, just like for any other cancelled enrolment. There is no automatic 'crediting' of their original voucher. If you have a business rule that states that students who paid with vouchers can not access a refund, then use the credit note to purchase a new voucher for the student that they can again redeem. In the example below, the enrolment fee of $264 was paid for partially by a voucher ($200) and partially by cash ($64) - this can be found by looking at the original invoice for the enrolment. When the enrolment is cancelled and the credit note created, I could then purchase another $200 voucher for the student with the credit note, leaving them with $64 in general credit, that could either be used towards another enrolment or refunded. If you are planning of transferring an enrolment, you can do this from the enrolment list view. This is similar to the 'cancel enrolment' process with the addition of opening Quick Enrol at the end of the process, pre loaded with the student, payer and course details, allowing you to make a speedy transfer of the student to another class. Create a credit note to reverse the enrolment fee to the payer - this is marked as default. Charge the payer an administrative fee of your choice - you can also choose if it includes GST and what account it gets recorded against. You can only transfer one enrolment at a time. Once you have filled out the sheet and pressed 'Proceed', a pre-populated Quick Enrol window will then open with the student's and payer's contact details along with the course from the 'transferred' enrolment. On occasion, you may need to create a credit note of refund for a student without using the enrolment cancellation process. This may be because you wish to offer the student a credit to apply to further training (perhaps there was problem with the class they attended), because they purchased another product outside of the class enrolment, or because you created a credit note for the wrong amount during the enrolment cancellation. Before you can issue any type of refund, you must create a credit note. 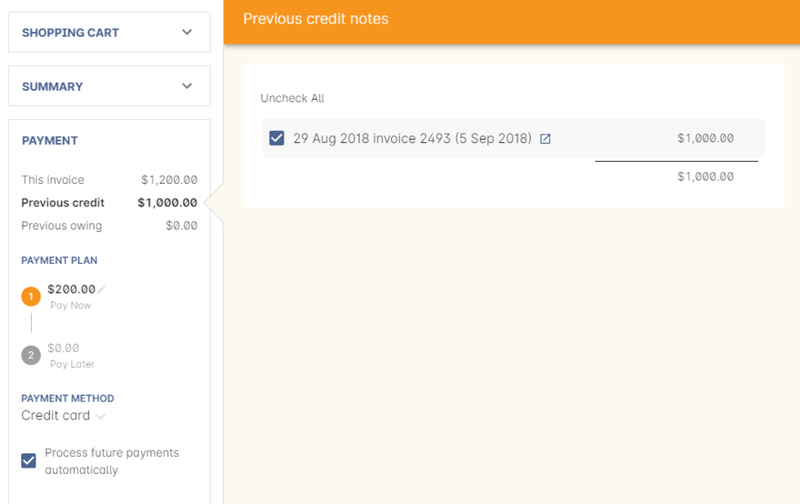 You can create a credit note manually in the invoice window. Note that this process is not necessary if you create a credit note during the enrolment cancellation process. The quickest way to create a credit note to fix an error is to find the original invoice, duplicate it and reverse it. Reversing an invoice manually allows you to make an adjustment (partial reversal) or complete reversal to an invoice created in error. Begin by opening the invoice window and locating the invoice that is problematic. Single click on the invoice, and from the cogwheel select the option 'Duplicate and reverse invoice'. A new manual invoice/credit note window will open. This new credit note will contain all the same invoice lines as the origional invoice line, but with each line item reversed. Remove any invoice lines you do not want to include in this credit note. To adjust the value of a remaining invoice line or charge the reversal to a different income account, double click on it. You can make changes to any of the fields available in the sheet. Optionally link the reversal back to it's original course-class code to deduct this amount from the class income. This will also make the invoice show in the class budget tab. 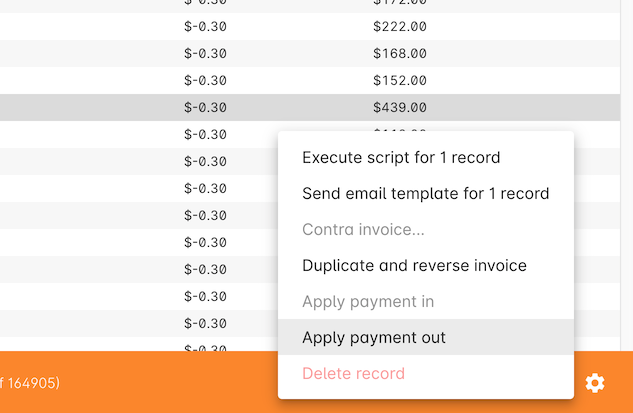 Click OK to save the adjustment to the invoice line, and repeat the process for each additional invoice line you want to reverse. Remove the check box from the 'send email' option if you do not want a copy of this adjustment to be sent to the payer. Ensure the balance of the new invoice/credit note is as you expect before choosing save. You can not edit the invoice/credit note after saving it. 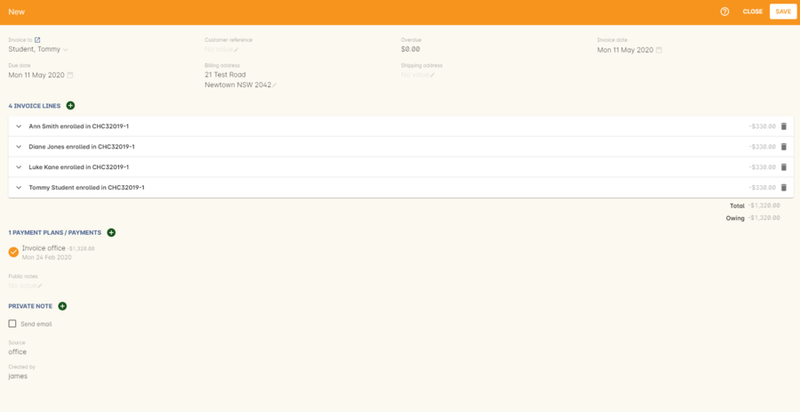 In the new Invoice record window, type the name of the contact you wish to give the credit note/refund too. The contact needs to already exist within onCourse. 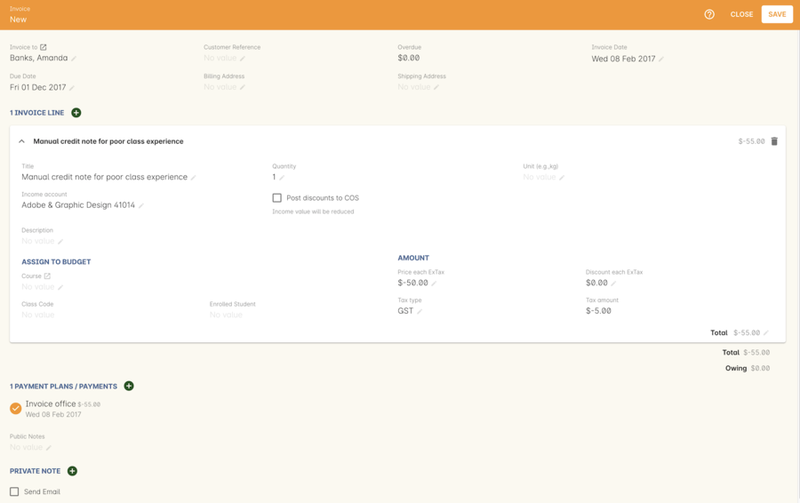 In the invoice lines section of the window, click on the '+' button to add charges/credits to the record. Give your item a title, select the general ledger income account it will be debited from, enter the appropriate negative amount in the 'Price Each Ex Tax' field. Ensure if you are creating a credit note that the value has a minus sign in front of it. Enter any other relevant information and save the credit note. 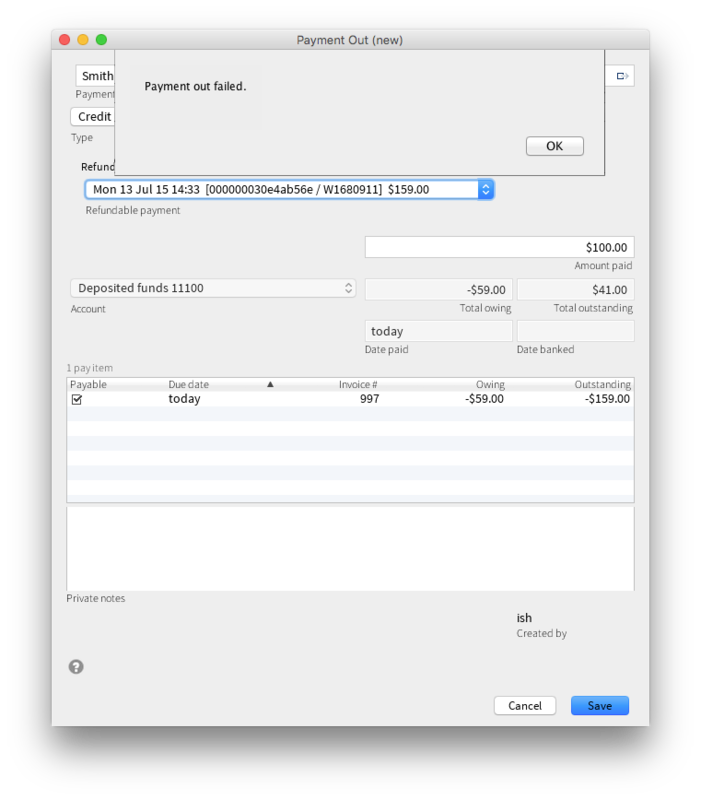 You will now see in the list view window an unbalanced invoice for a negative amount. This is the credit note. Sometimes students enrol in classes and pay the full fee, and after enrolment they realise a discount needs to be provided as the student was eligible for a reduced enrolment fee. In onCourse, when a discount is issued the COS account Discounts Given is credited and the chosen income account is debited. To create a manual discount, follow the steps above to issue a manual credit note, but enter an amount in the Discount Each ex tax field. This will create a credit note, but add the cost of the discount to the COS account, just like if it was taken during the enrolment. Please note that discounts processed manually will not be linked to the class and will not show in the class budget, unless you add the link back to the class in the invoice line. Contacts with credit will appear in the invoices window as 'unbalanced' invoices, showing with a negative balance. The next time the contact enrols, or pays for another student's enrolment, they will automatically be offered their credit to use towards their fee payment in the Quick Enrol process. This information will show in the bottom of the quick enrol window next to previous owing as a minus amount. The amount due for payment will automatically adjust. If you processed a payment in record in error, i.e. 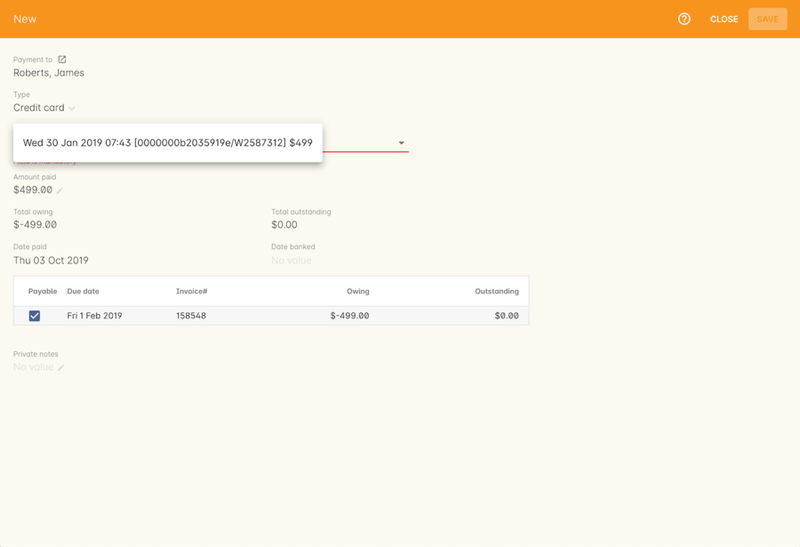 recorded an EFTPOS payment that failed to process through your EFTPOS terminal, and want to reverse the payment to set the invoice back to unpaid, you can do this in the Payments In window. To reverse a payment, it first of all must be unbanked. Some payment types are set to bank automatically on creation. If your payment is banked, double click on the payment in record and removed the date banked date, then save and close the record. In onCourse go to "Accounts" then "Payment In". Highlight the payment in record to be reversed. Click on the cog wheel and select "Reverse payment". Click reverse of the new pop up window to confirm you want to the record to be reversed. A new negative payment in will be created of the same payment type as your original payment, and both payment lines will have the status REVERSED. If the original payment was already marked as banked, then this reversal process will cause it to be unbanked. The banking deposit window will show both halves of the reversal. You should bank them together so they balance each other out. If you wish to give a contact back their money, you need to create a payment out record. You can return cash to the payer, write a cheque, or if they have paid by a credit card through onCourse (not via an EFTPOS terminal) you can automatically reverse the payment back to their card. Manual credit card reversals can also be done through an EFTPOS terminal, but you will need to contact the payer to get their card details first. If you refund a fee via an EFTPOS terminal, you will still need to record a payment out entry within onCourse, simply select payment type 'EFTPOS', even if the reversal was to a credit card. It's the method that is important to record here, not the card type. In onCourse go to "Financial" then "Payment Out"
You will see the total balance of their credit notes available to be refunded. Some contacts may have multiple credit notes. You can refund all or a part of their total balance. You can not refund more than the total balance. Chose the method with which you wish to refund the contact. If you choose credit card, any available transaction will be available from the list to reverse. The list of available transactions is ordered by date with the most recent transaction at the top of the list. As shown in the example below. Save the payment out record. The contacts credit note balance will be reduced by the amount you have just refunded. Where needed, you can adjust the 'date paid' for the payment out to a date other than today, if the payment out was processed in the past (e.g. EFT) and you are recording it in onCourse some days later. onCourse does not store credit card numbers. What it does store is a transaction reference number supplied by the bank. This transaction reference number allows you to reverse up to the original amount paid during the transaction. This means you can refund the payer with complete confidence that the payment is being returned to the original credit card that paid for the enrolment. 1. Credit card transactions are only available to reverse up to three months after the initial date of purchase. An attempted refund to a transaction older than this will fail. 2. You can only refund UP TO the original amount of the transaction. You can not refund the student more than they paid per transaction. For example, if two $100 enrolments we paid for in separate credit card transactions by the same contact and both cancelled and eligible for a refund, you would need to process two payments out of $100 each, once against each transaction. 3. If the credit card you are attempting to refund has been cancelled by it's owner, or expired, the attempt to refund it will fail. You will need to contact the student and arrange an alternate refund method. 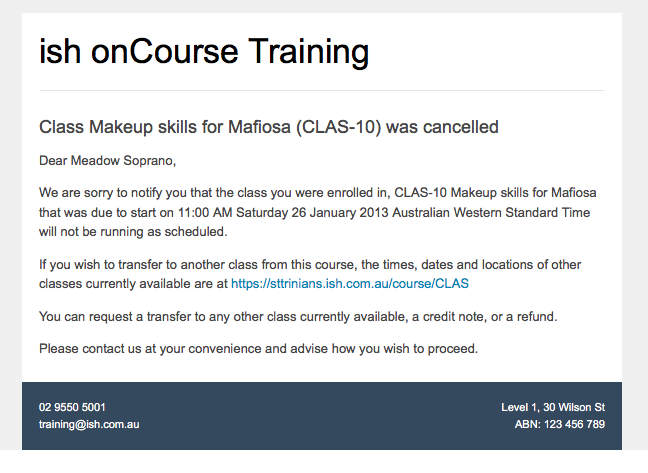 If your class is not financially viable, or needs to be cancelled for other reasons, onCourse has the tools to allow you to cancel the enrolments, notify the students, refund the students or provide them with credit notes, and use their credit to book them in to another, or the next available class. Before you cancel the class, you may wish to print a record of the enrolled students, via a report like a class roll or student contact list so you can annotate their preference of refund, credit note or transfer. There is an optional script you can enable to automatically notify all students enrolled in the class that their class is no longer running as scheduled. If this script is enabled, it will contact the students at the end of this process and there is no option to prevent the message from sending on a class by class basis. See below for more information regarding enabling and disabling the script. Create credit note to reverse the enrolment fee - this is always checked and cannot be changed. This will notify you how many credit notes will be created. Send credit note email (ticked by default) - this sends the credit note details created by the first step to each payer of the enrolment, advising them of the credit they now have available to use towards another enrolment, or request to be refunded. Once a class is cancelled it will appear in the class list view with an icon with a cross through it and the text greyed out, and be available in the core filter 'cancelled classes'. Cancelled classes that were visible on the web will have their 'enrol now' button changed immediately to 'cancelled', and will not allow any more enrolments either through the web or via Quick Enrol. It can be beneficial to leave cancelled classes displaying on the web, particularly if you have published the class details elsewhere in a brochure. You may also choose to manually unpublish the class by single clicking on it and choosing the from the cogwheel 'Remove class from website'. A cancelled class can not be 'un-cancelled'. However, should you need to reinstate the class, highlight your cancelled class and from the cogwheel option choose 'Duplicate 1 class' moving the class forward by zero days (essentially making another copy of the class with a new class code, but all the other details the same). This will not re-enrol the previously cancelled students... should you wish to do this you will need to enrol them again in the new class as per the usual processes. To prevent large scale errors, cancellations of classes are not available for bulk processing. You will need to cancel each class individually. Two scripts and sets of email templates are available by default in onCourse to contact the students enrolled and the tutors assigned to a class when it is cancelled. The 'Cancelled class notice for tutor' must be enabled to automatically contact tutors via the 'Tutor notice of class cancellation' email template. The 'Send class cancellation' must be enabled to automatically contact enrolled students via the 'Class cancellation' email template. It is important you read, and possibly customise, the text of these two sets of email templates before enabling the scripts as the wording must be consistent with your college policies regarding cancelled classes, refund options and credit notes. If you adjust the wording of any of the email templates, be sure to adjust the plain text and HTML versions in the same way. The student notification email can also be sent manually from the enrolment window. Highlight the enrolments you wish to send the message to and choose send email from template > Class cancellation from the cogwheel options. Advertising classes, taking enrolments and payments and then having to cancelling the class due to insufficient enrolments or change or circumstance is a real cost to a training organisation. From a business perspective, rescheduling a class to a future date is far more advisable than cancelling a class, but sometimes a cancellation will still be necessary. As an organisation, should you wish to understand your cancellation rates and 'lost' potential income, a report called 'Cancelled classes count' is available from the class list of reports. Begin by selecting the core filter 'cancelled classes' to show only your cancelled classes in the list view. Then search or highlight the classes in the range you wish to report on. Once you have selected the classes, choose File > Print > Cancelled classes count, or use the share icon. This report will show you the enrolments that were in the class prior to the cancellation and the income that had been collected. If you wish to transfer a student, first you need to cancel their existing enrolment, then enrol them into a new class. Choose to manually discount the enrolment in Quick Enrol by $20, allowing their credit of $100 to cover to apply leaving the account with a balance of $0. If their new enrolment is less expensive than their previous class, you can choose to keep their credit on file indefinitely to apply to a future enrolment, or provide them with a refund for the credit remaining once you have processed the new enrolment. 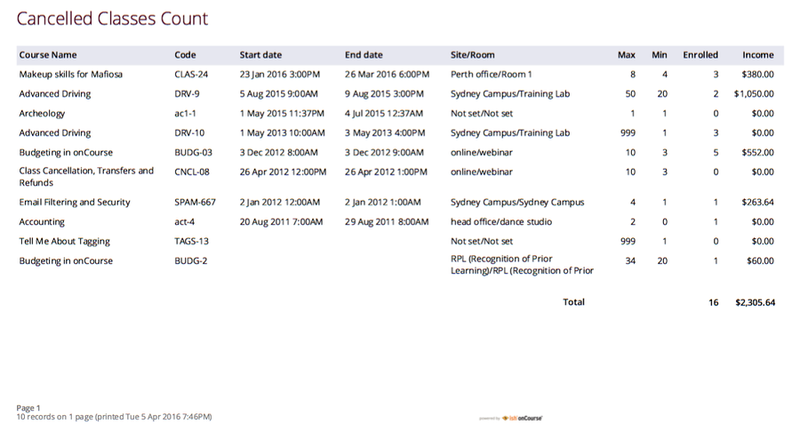 onCourse tracks enrolments and financial data in a way which leaves a complete audit trail. So at any time you will be able to see all the enrolment history for every student, including enrolments they have withdrawn from. This is very important for financial auditing and system security reasons which especially when several staff might be making changes or looking at the history in the system. Furthermore the refund/Quick Enrol process makes the work flow clearer when the new class has a different cost to the old. The operator is explicitly prompted to collect an additional payment or retain part of the credit note. By then applying an additional charge or discount, general ledger adjustments are kept accurate and clear. Remember that the opposite of an invoice is a credit note. If the student owes you more than you originally charged them, create a manual invoice for the difference. If you charged them too much in error, create a manual credit note for the difference. If you want to check the balance of a student's account, go to the contact window and look at their finance tab. 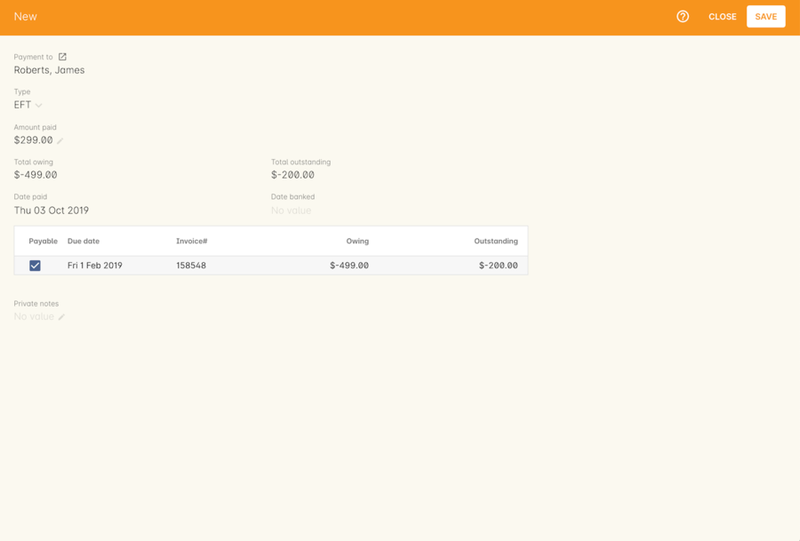 This will show all invoices, credit notes, payments in and payments out at the current balance of their account e.g. do they owe you money, do you owe them money, or is everything square? You can also use the contra pay feature to use the balance of a credit note to 'pay off' an outstanding balance on an invoice. Select the credit note in the invoice window, and using the cog wheel option 'Contra Invoice..' locate the invoice you want to pay. This only works for credit notes/invoices for the same contact. If the contact in credit wishes to use their credit towards another person's enrolment, follow the steps for 3rd Party Payments, ensuring that you select the contact in credit as the payer.